We recently released Billions in Change 2, a follow-up to our original documentary and an update on what we’ve been working on over the past couple of years. Already the trailer has had over 100 million views. 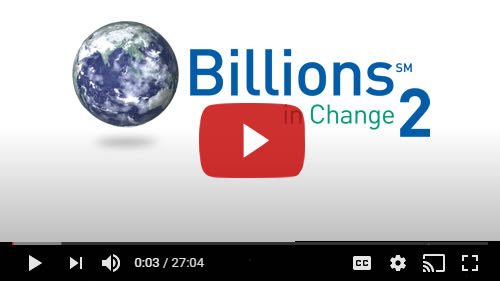 Like the ideas featured in the first film, Billions in Change 2 introduces a series of inventions to improve humanity. In fact, some of the new products evolved from the process of improving and refining the solutions shown in Billions in Change. The main difference is that these new inventions are already being deployed and we’re getting ready to scale. That film was the story of what we’d been doing. This film is the story of what we’ve done. Shivansh Fertilizer: A free and revolutionary farming technique that enhances crop yields, crop quality, and most importantly, increases farmer income. Visit BillionsinChange.com for more information on each of these inventions, as well as for how to get involved with Billions in Change. Our goal is to bring these solutions to the unlucky half of the world so that they can meet their basic needs, which are the foundation of wellness and livelihood. I have a lot more to tell you, but for now, I hope you’ll watch the new film, check out our new website, and let us know what you think. P.S. I’m in India right now and so far the response to the film and the new inventions has been amazing. This past Monday the Uttarakhand government and Chief Minister Trivendra Singh Rawat committed to obtaining 100,000 HANS PowerPacks to provide to villages in need. It’s difficult to bring electrification from the power grid to villages in the more mountainous regions of the State. So the PowerPack, as a source of “mobile electricity”, is a perfect solution. ©2017 Classic Films, LLC. All Rights Reserved.